I discussed this unusual branch before, but now I must ask again. Do trains still run on this line? The line is basically a stub since all rail connections to the east are either covered in brush or torn up. I've heard that NS used the line for garbage train ops until a few years ago when the contract went to CSX, who stopped using the branch, so I thought the line was permanently abandoned. Now just yesterday, I read a quite hilarious (but still serious) tweet about how Journal Square smells like garbage. PATH's official alert account replied that the smell was caused by the garbage trains, which I thought had stopped some time ago. So does anyone have any information about this short branch? Do freight trains run on this line at all or is PATH's alert account just wrong about the source of the smell? MaRoFu wrote: I discussed this unusual branch before, but now I must ask again. Do trains still run on this line? The line is basically a stub since all rail connections to the east are either covered in brush or torn up. I've heard that NS used the line for garbage train ops until a few years ago when the contract went to CSX, who stopped using the branch, so I thought the line was permanently abandoned. A year or two ago, NS got the trash contract back from CSX (62V/63V? My symbols are rusty...) so now I assume they're running as they used to. I don't get it. With the reconfiguration of Marion Jct and giving up the Nave connector from National Docks (maybe not calling it the right name), both about 15 years or so ago, there are no freight trains anywhere near Journal Square any more, to the best of my (imperfect) knowledge. And I assume the NY trash is coming from Staten Island over the B&O Arthur Kill bridge, which leads trains to Greenville Yard (and then out west on the old LV to NS) so it isn't even getting close to Jersey city. Just the usual PATH public relations bs I would assume. pumpers wrote: I don't get it. With the reconfiguration of Marion Jct and giving up the Nave connector from National Docks (maybe not calling it the right name), both about 15 years or so ago, there are no freight trains anywhere near Journal Square any more, to the best of my (imperfect) knowledge. And I assume the NY trash is coming from Staten Island over the B&O Arthur Kill bridge, which leads trains to Greenville Yard (and then out west on the old LV to NS) so it isn't even getting close to Jersey city. You're right that all of the WM (DSNY) stuff comes from SI/Brooklyn/Queens. This isn't DSNY though. As I understand it, this is trash from places that are not NYC, or trash that is handled by private carriers. The stuff is transloaded at the south end of Kearny point at the weird little yard there. The reason it ends up in Journal Square is that -- and someone please correct me if I'm mistaken here -- the switch off of the branch that goes down that way faces east, i.e. requires a relay move if you're heading out via NS. CSX doesn't want NS fouling the east end of their yard at South Kearny, so NS has to pull east beyond Marion Jct to run around and head west -- hence their going into JSQ. That's pretty much it. The two freight tracks going through Journal Square serve as a runaround and as a tail track. The tracks connect only to the PATH service facility to the east of Journal Square, which rarely receives any freight cars. Conrail crews pull the loaded train out and then spot the empty train. The Loaded train is pulled out of NJRC and will need to be run around to head west. If the train is too big to fit at JSQ, the CR crew will have to run around the train between CP-1 and CP-West Croxton, then go South/West back to Stock. 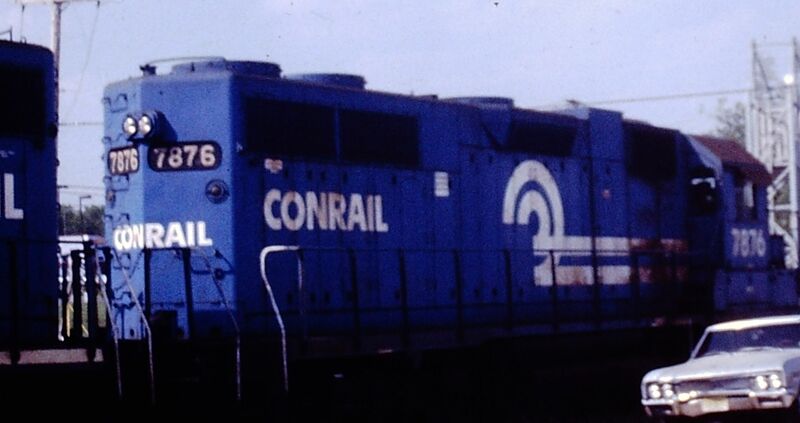 The Conrail crew will either place an engine on both ends of the empty train or take the empty train to JSQ (old CP-Waldo), if it fits, run around it and pull it into South Kearny and down the Central Ave Ind Track to New Jersey Rail Carriers.